Windows Defender is the default built-in free antivirus and anti-malware solution in Windows 10 that protects the computer against viruses, malware, spyware, and other threats, and provides network inspection, boot-time and real-time protection when using Windows PC. Windows Defender was first introduced as a free antispyware program download for Windows XP. It then started to include in Windows Vista and Windows 7 by default, and enhanced to be a full antivirus program replacing Microsoft Security Essentials as part of Windows 8, continuing to Windows 10 and later versions. Before you decide whether to turn on or turn off Windows Defender in Windows 10, there are two points which you should aware of. Windows Defender is automatically enabled on new Windows 10 system and when no other antivirus, antimalware or security protection software is installed. If you install another anti-malware or antivirus program for security protection, Windows Defender automatically disabled itself. If you’re not a fan of Windows Defender, or already purchased or provided with the license of third-party security software, you can disable Windows Defender using one of the following methods. Disable Windows Defender without another antivirus or anti-malware software exposes the PC to considerable security risks. If you want to get rid of Windows Defender Security Center icon on the Taskbar (which is available since Windows 10 Version 1703) even after you have installed another antivirus software or have disabled Windows Defender, here’s how to remove the Windows Defender notification icon. Windows 10 disables Windows Defender when it detects another antivirus security protection software is installed. For example, Symantec, Norton, McAfee, Kaspersky, AVG, Comodo, 360, Avira, Panda, ZoneAlarm, ESET and etc. No other action is required. Navigate to Computer Configuration -> Administrative Templates -> Windows Components -> Windows Defender (in Windows 10 RTM / v1511 / v1607) or Windows Defender Antivirus (in Windows 10 v1703 or later). In the right pane, double click on Turn off Windows Defender or Turn off Windows Defender Antivirus. Select Enabled radio button to disable the Windows Defender. Press OK or Apply. You may need to restart the computer for the change to take effect. This method is temporary, until the next system reboot. Go to Update & security -> Windows Defender. Under the “Real-time protection” section, toggle the slider to Off. Go to Virus & thread protection. If applicable, click or tap on Yes on User Account Control dialog prompt to allow the app makes changes to the system. The following changes to registry essentially implements the group policy that turns off Windows Defender as outlined in method 2 above. So this method is useful if your home edition of Windows 10 does not come with Local Group Policy Editor. In addition, it also removes any startup items that defined as Windows Defender related (only useful in earlier version of Windows). You can copy and paste the following text into a text file and save with a .reg extension, and then run it to apply registry registration entries to system registry automatically. Or, you can manually navigate to each and every registry key to make the necessary changes. 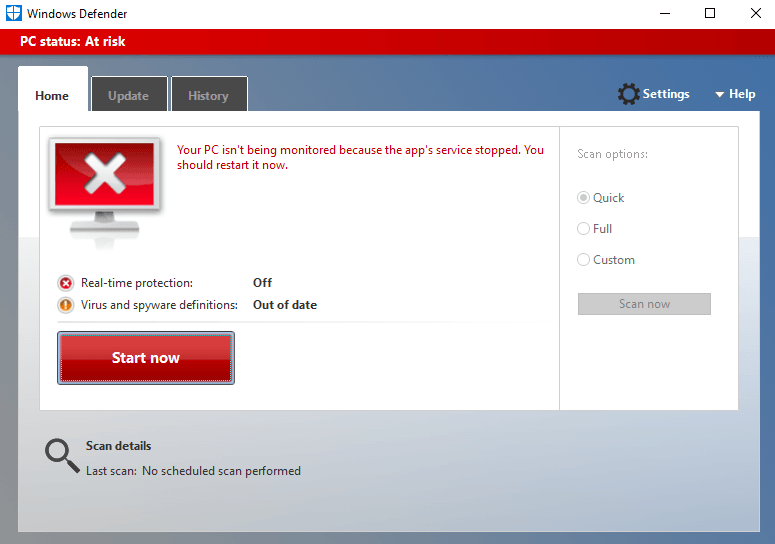 No third-party antivirus or anti-malware security protection software is installed (in such cases, you can only enable periodic scanning with Windows Defender). The service couldn’t be started. 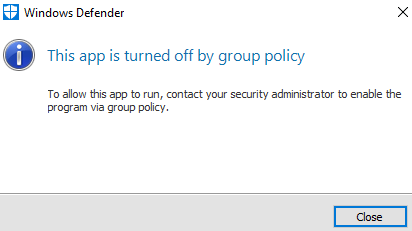 The program is blocked by group policy. For more information, contact your system administrator. Click Help for more information about this program. Open Windows Defender or Windows Defender Security Center (in newer versions of Windows 10). In Windows Defender, the window will display a red cross that indicates there are some issues with Windows Defender, e.g. app’s service is stopped or real-time protection is turned off. Depending on the scenario, click or tap on the red Start now or Turn on button to enable Windows Defender. 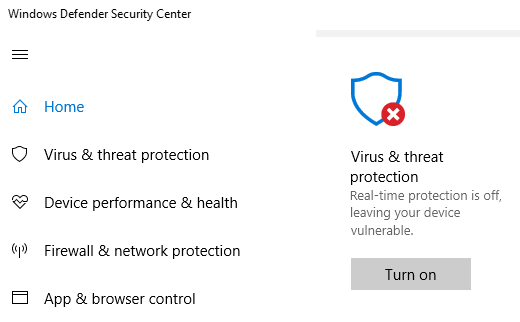 In Windows Defender Security Center, the red cross will appear on the lower right corner of shield icon above the “Virus & thread protection”. Below the title is the description on the issue that causes the error warning, such as real-time protection is off or threat service has stopped. Click or tap on the Turn on or Restart now to turn Windows Defender back on.